The Melbourne Cup Carnival is one of the most exciting times on the fashion calendar in spring, where the gentlemen dress in fine suiting consisting of fabulous accessories, including shirting, pocket squares, ties, cufflinks, waistcoats, footwear and even hats. The ladies dress to look elegant and sophisticated choosing the latest from the current season's trends including beautiful florals, laces, metallic, frills and drapery. Millinery is a must to complete the race day look. The Melbourne Cup Carnival consists of four race day events, AAMI Victoria Derby Day, Emirates Melbourne Cup, Kennedy Oaks Day and Emirates Stakes Day. This year the beautiful Rebecca Harding is representing the Myer Fashion's on the Field as their ambassador. Rebecca has a love of both fashion and horse racing and is the perfect choice to represent the Spring Racing Carnival. 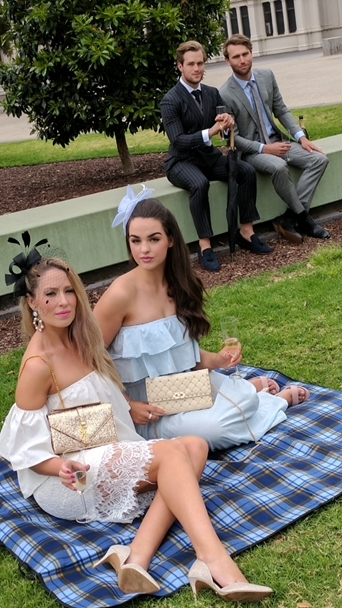 This is the 55th year for the Myer Fashions on the Field and remains Australia's most prestigious fashion event with fashionista's both from Australia and around the globe competing to be this year's best race day dressed. When creating your race wear look think about colour, texture and about your millinery and accessory choices. Creating difference and adding your own uniqueness, while remaining elegant is the key to being noticed on the runway. Derby Day is the most elegant of all the race days, the dress code is traditionally black and white monochrome. Ladies and gentlemen can add sharp accessory detailing to complete their look. Here we have added some bold luxurious accessory items to complete this Derby Day look. The millinery is exciting and intricate, featuring pearls and elevated sculpture. A luxury statement designer bag also adds extra sophistication and elegance. The gentlemen have an opportunity to wear traditional black and white or depart from the norm with a grey or charcoal, this is the only exception to the rule when styling for Derby Day. The Melbourne Cup is the race that stops the nation, not just in Melbourne but for punters around the globe. The Melbourne Cup is a day to dress bold and beautiful, it's all about colour and making a statement. Oaks day is traditionally known as 'ladies day', but that doesn't stop the gentlemen from also attending! The Oaks is a day the ladies can be more feminine in their fashion choices, styling towards softer more floaty looks including frills, florals, lace, and pastels are also a popular trend. The gents can incorporate some softness also into their styling through using pastels and lighter shades in their shirting and accessories. Stakes Day is the last race day of the Melbourne Cup Carnival, it is also known as family day. Dress for a more family friendly vibe, something a little less structured. A skirt and top, floaty dress or even a pant suit is accepted. Millinery can also be less formal, a fabulous boater or classic headband could be an option for this event. Photography is from Melbourne My Style, Flemington VRC, Ian Rios and Styled by Ramzy.